Income Tax Department has taken many taxpayer friendly initiatives in the recent times and sharing the access of Form 26AS is one of these initiatives. Form 26AS is the statement showing the details of taxes paid on your Permanent Account Number (PAN) during a particular year. It shows the details of the tax deducted at source (TDS) including the deductor details, tax paid by the taxpayer on his own, details of tax refund paid during the year and details of high-value transactions entered during the year. How can Form 26AS be accessed? It can be accessed through the logging into the Income Tax E-filing site. Alternatively, one can access Form 26AS through the net banking facility of most of the banks. One can check it online or download the details year-wise in PDF or TXT formats. Why is it important to refer Form 26AS? It contains the Income Tax Department’s version of the taxes paid on your account. As such, if the tax deposit details are appearing on your Tax Credit Statement, the taxes so claimed in the ITR will be automatically tagged with the details in the tax credit statement. However, in case the details being claimed in ITR are not present in Form 26AS, the credit for such tax is not given by Income Tax Department and hence, may result in the generation of tax demand from the department. What to do if anything is missing/ wrong? 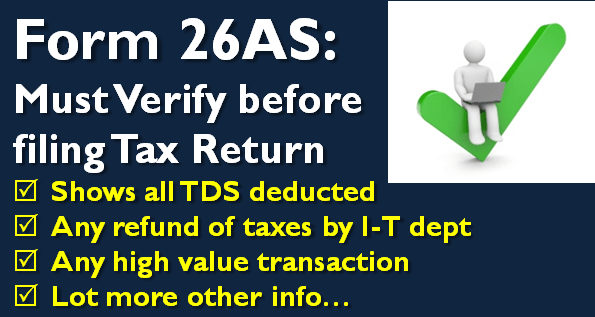 There might be occasions when your tax deposit transactions on account of advance tax/ TDS may not appear in Form 26AS. This might be due to the input of wrong PAN by the bank where such tax has been deposited or by the deductor deducting the tax on incomes paid to the assessee. So, in such cases, you must contact the respective bank/ deductor to rectify the details. Income Tax Department cannot help directly in this matter, as this facility only populates the details provided by various other agencies and cannot make rectifications on its own. Hence, it becomes important to regularly monitor Form 26AS and take necessary action in case of any missing/ inappropriate details. I make sure to check it before the filing of my ITR to avoid any hassles at a later stage. Do you check it too?